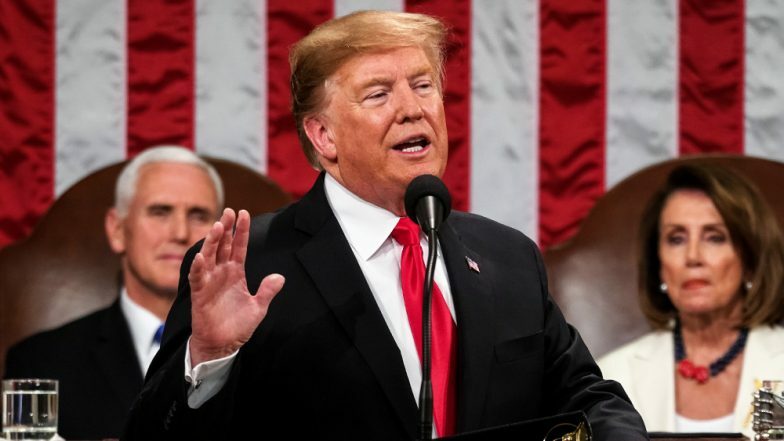 President Trump delivered his second State of the Union address to Congress on Tuesday evening — his first such speech since Democrats took control of the House of Representatives. What were the main takeaways? The White House had previewed Trump’s speech as an attempt to reach across the aisle and encourage “comity” — a term that senior counselor Kellyanne Conway literally spelled out to reporters on Monday. But there was no evidence of that in the most striking moment of the night — a strong jab by the president at investigations of him and his 2016 campaign, which he implied risked hurting the American economy and the nation at large. “An economic miracle is taking place in the United States — and the only things that can stop it are foolish wars, politics or ridiculous partisan investigations,” he said, drawing what looked like a wince from Speaker Nancy Pelosi (D-Calif.), sitting directly behind him. Trump’s refrain that the investigations into him are a “witch hunt” is commonplace in his tweets and interviews. But he had not mentioned the topic at all in last year’s State of the Union address. His approach this time seemed as much a reaction to the investigations House Democrats are pursuing as it was to special counsel Robert Mueller’s probe. Either way, the president seems intent on all-out confrontation. The suggestion from senior administration officials that Trump would adopt a conciliatory tone were not wholly untrue — but those efforts were counterbalanced by frequent slabs of red meat thrown to his base. He also extolled his achievement in accomplishing a measure of criminal justice reform — a signature project of his son-in-law and senior adviser Jared Kushner, who was in attendance. But there was plenty of rhetoric that cut the other way. In an embrace of the populism that got him elected, he cast his stance on immigration in stark class terms. “Wealthy politicians and donors push for open borders while living their lives behind walls and gates and guards. Meanwhile, working class Americans are left to pay the price for mass illegal migration,” he said. Some observers will see the hand of senior advisor Stephen Miller in those lines. But they may also reflect the president’s own wishes. The New York Times had reported earlier on Tuesday that Trump had been displeased by early drafts of the speech, which he considered too soft on Democrats. One of the most visually compelling — and hard to interpret — moments of the speech saw Trump and female Democratic lawmakers engage. The vignette began with Trump talking about women being the main beneficiaries of the nation’s strong economy. Female Democratic lawmakers, many dressed in white in tribute to the suffragette movement, got to their feet in celebration of their own election and were also applauded by many of their male party colleagues. “You weren’t supposed to do that,” Trump said. He went on to note the increased female share of the workforce and, in apparent good humor, said, “Don’t sit yet, you’re going to like this,” before adding that there were more female lawmakers than ever before. Trump’s reaction left room for interpretation as to whether he was genuinely riled or enjoying the jousting. But it is a moment that is certain to get a lot of cable news play on Wednesday. Much speculation before the address had focused on the likely dynamics between Trump and Pelosi, who has just begun her second stretch as Speaker. When Pelosi first took the gavel, in early 2007, then-President George W. Bush made a point of congratulating her — she was the first female Speaker ever — at the beginning of his State of the Union address. Trump offered no such congratulations, nor did he even pause for the Speaker to introduce him, as is the custom at State of the Union addresses. Pelosi did applaud at some of the less contentious parts of Trump’s speech — she got to her feet when he urged a renewed focus on infrastructure investment, for example. But at other times, she smirked or shook her head, making her disagreement plain. Notably, Trump did not refer at all to the 35-day partial government shutdown, where he faced off against Pelosi — and is almost universally seen as having lost. Trump’s speech was given before a number of Democrats who are already running to replace him, or who might yet do so. Sens. Cory Booker (D-N.J.), Kirsten Gillibrand (D-N.Y.), Kamala Harris (D-Calif.) and Elizabeth Warren (D-Mass.) are already running. Others, including Sen. Amy Klobuchar (D-Minn.) and Sen. Bernie Sanders (I-Vt.), could get in soon — Klobuchar has said she will make a “big announcement” on Sunday. Sanders gave his own response after the speech, but fears that he would upstage former Georgia gubernatorial candidate Stacey Abrams — the choice to give the official Democratic response — proved unfounded. Abrams was met with near-universal acclaim for her performance at a famously difficult task. During Trump’s speech itself, the likely 2020 contenders sometimes seemed to be competing with each other for who could show the most obvious disdain for Trump in their facial expressions. Harris at one point shook her head during some of the president’s remarks on immigration. Warren seemed to watch much of the speech in stone-faced silence, Gillibrand went one better, fundraising off a C-SPAN clip where she was seen rolling her eyes. For all the pomp and circumstance that surrounds State of the Union addresses, it is hard to think of even a single one that has fundamentally shifted the political dynamics of the moment. In 2019, with the most polarizing president of recent times in the Oval Office and the nation’s divisions deeply entrenched, that pattern will surely not be broken. The stark political divisions were dramatized on Tuesday night at the many points when Republicans leapt to their feet to applaud the president while Democrats remained seated and still. It was a reminder, if one was needed, that it will soon be back to business as usual in Washington, where a yawning gulf separates the president and the opposition party.